We’ve made it easy for you to find the best water bottle for extreme weather conditions. If you’re cycling, hiking, traveling with your dog, kayaking or skiing, you’re most likely going to push your water bottle to the edge of its temperature thresholds. Since we’re in New England, we rely on selection criteria that takes into account the extreme weather of New England—four seasons, very cold weather and warm summers. These same criteria will fit well for other locations such as the Pacific Northwest (Oregon, Washington), Arizona, Florida and Alaska; or, for those who live in southern California but regularly push the boundaries of their water bottle’s capabilities. Regardless of where you live, keeping your hydration in check during any season is an important priority that we also discuss—and factor in to our evaluation. If you’re an active person, your water bottle allows you to extend the length of your outdoor activity and keep your health in check. If you’ve ever dealt with heat stroke or the consequences of hydration, you know that such a condition can be dangerous or even life threatening when you’re far away from civilization and pushing your physical abilities. Since we’ve done the majority of our testing in Maine, California and Oregon, we’ve subjected each of these bottles, bladders or filters to extreme conditions. Nobody likes warm water on a cold day; especially if you’re tired and far away from a source of water. And even worse than warm water is heat stroke when you’re four or five days into a backpacking trip. To simplify things for you, we’ve narrowed down our selection of our best water bottles by activity: cycling, hiking, kayaking, backpacking, skiing and weekend warrior. Where possible, we recommend accessories that will help you further enhance the temperature controlling features of your bottle or water system. We also factor in “retention” or equipment that will help you prolong the life of your bottle and also reduce the chance you’ll drop it while boating, hiking or taking a sip of warm coffee while on a ski lift. When evaluating the best water bottles for extreme weather conditions, we visited Bicycle New England to see how the experts there rank their choice of water bottles for cyclists. We also took into account price, reviews from Amazon and our own experience with bicycle water bottles. Form factor, insulation, grip, ease of use, nozzle quality and BPA/BPS free are all features we prioritize. The CamelBak Podium Ice Insulated Water Bottle is probably one of the best water bottle currently on the market for bikers in 2019. It has very high ratings, a valve that locks and holds up to 21 oz of liquid. It claims to keep water cold four times as long as regular sport bottles and when evaluating reviews, this appears to be a valid claim. It’s lightweight, easy to squeeze, low cost, and has a wide-mouth opening that makes it easy to add ice cubes or lots of liquid quickly. While some people have complained that the bottle is a little difficult to grip, we like the form factor and recommend this bottle as our top choice in cycling water bottles. Purchase the CamelBak Podium Ice Insulated Water Bottle for $23.70 at Amazon. The CamelBak Podium Big Chill Insulated Water Bottle is an excellent choice when comparing it to the Podium Ice. You’ll get a few fewer features, but you’ll gain 4 ounces of capacity. CamelBak claims that the Podium Big Chill will keep your water cold only twice as long as an non-insulated bottle, but this is probably just a more conservative claim than the 4x claim made for the Podium Big Chill. This water bottle comes with a self-sealing Jet Valve cap and a secure lockout to minimize spills during transport. Like the Podium, it relies on a double-wall construction, so it will do a good job keeping cold liquid cold and warm liquid warm. There are really only two water bottles that make the cut for this list. Our recommendations of “backpack” water bottle are either the 21oz Hydroflask or the 26 oz Yeti Rambler. Both will last forever and provide you with predictable temperature management. As long as your kids don’t lose them, you may also be able to pass them on as a family heirloom one day. 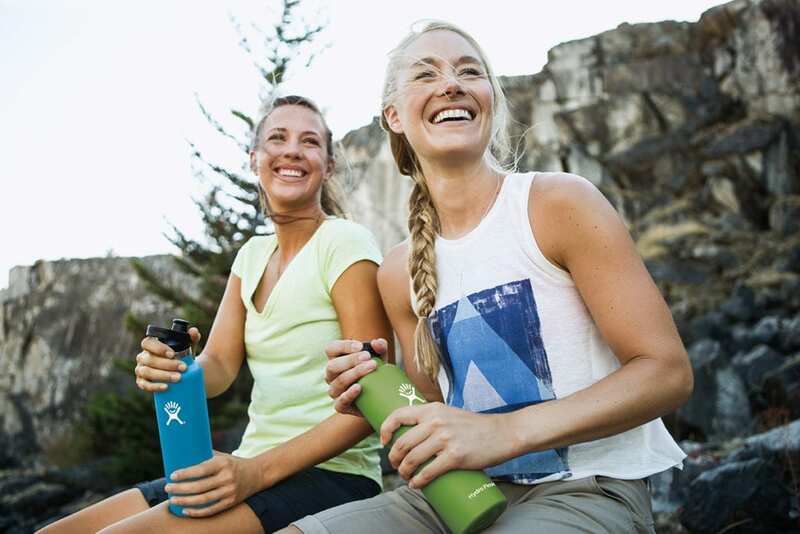 Hydro Flask was created nearly 10 years ago in Bend, Oregon. Many Hydro Flask owners are extremely loyal customers for a reason. Hydro Flasks are powder coated with Tempshield insulation. TempShield refers to a double wall, vacuum insulated technology that guards the temperature of your drink. Keep in mind that these bottles come with a lifetime warranty. They are also very easy to clean since you’re not dealing with plastic components, which explains the lifetime warranty. The Hydro Flask bottles come in 32, 40, and 64 ounces. We have one in each size and can’t speak enough about how phenomenal they perform. All of this means they work exceptionally well in any weather conditions. They fit well in your palm and keep your ice (or hot chocolate) at the right temperature for a full day. Hydro Flask is also a stand up company who provides phenomenal customer service. If you ever visit their company in Bend, Oregon you’ll find a group of individuals who are committed to outdoor lifestyle and quality products. The 26 oz Yeti Rambler is one well designed bottle. Truth be told, it’s a hall of fame piece of outdoor gear. Our claim may not appear exaggerated when you realize the Yeti Rambler is Yeti’s “poster” water bottle for extreme outdoor conditions–and Yeti knows extreme weather. Even the form factor of the bottle is built for endurance as the grab cap (Triplehaul Cap) allows you to secure the bottle to your backpack, kayak or other bottle(s) with a carabiner or strap. 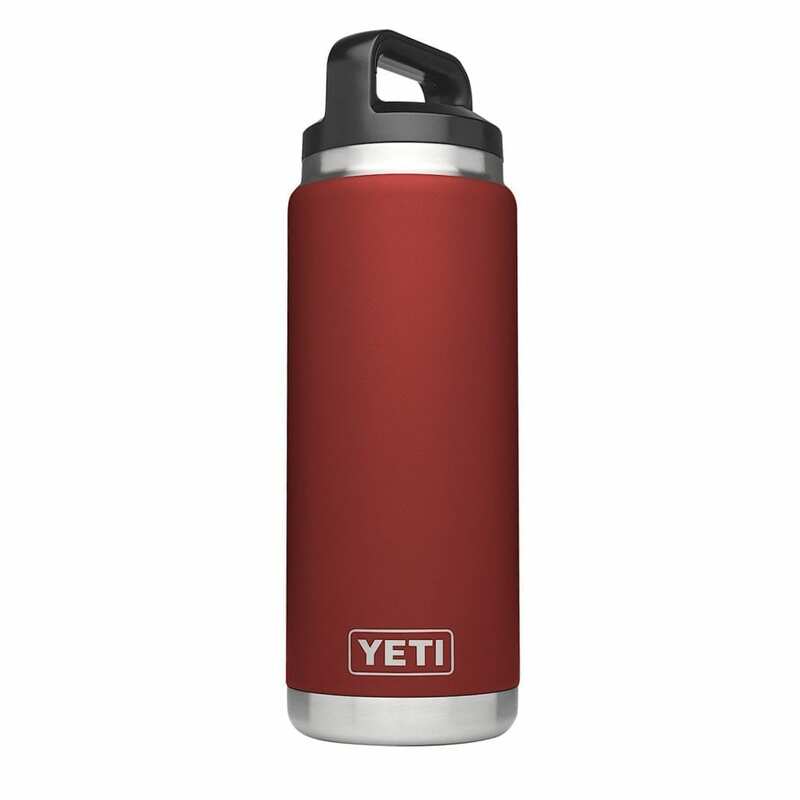 While Yeti is primarily known for the quality of its coolers, their water bottles give Hydro Flask a run for the money. You’ll almost always pay more for Yeti equipment, but you’ll notice that Yeti products seem to start random conversations with other outdoor lovers as the their usability is almost surpassed by their tremendous aesthetic and reputation. The double-wall vacuum insulation and 18/8 stainless steel construction provide the foundation for a bottle design that will last a lifetime and keep your liquids at the right temperature regardless of how extreme your weather. If not for our Oregon roots and our love for all things Hydro Flask, we’d rare the Yeti Rambler as our number one extreme weather water bottle; especially because of the ingenious Triplehaul Cap. Also, keep in mind that the 26 oz Yeti Rambler is bigger than a 21 oz bottle, so make sure you’re able to accommodate that extra storage requirement if your plan is to carry this bottle in a backpack. In this section, we prioritize weight, cost and versatility. Our top bottles in this section therefore fit well for a 2-4 hour outing in the mall, on a short trail or during a quick trip to a sporting event. You might think about these bottles as the best bang for the buck or the weekend warrior junior option. If you want a standard, non-insulated bottle for your rides, the Pogo Tritan is a good choice. You can buy one of these bottles at Amazon for under $9.00. 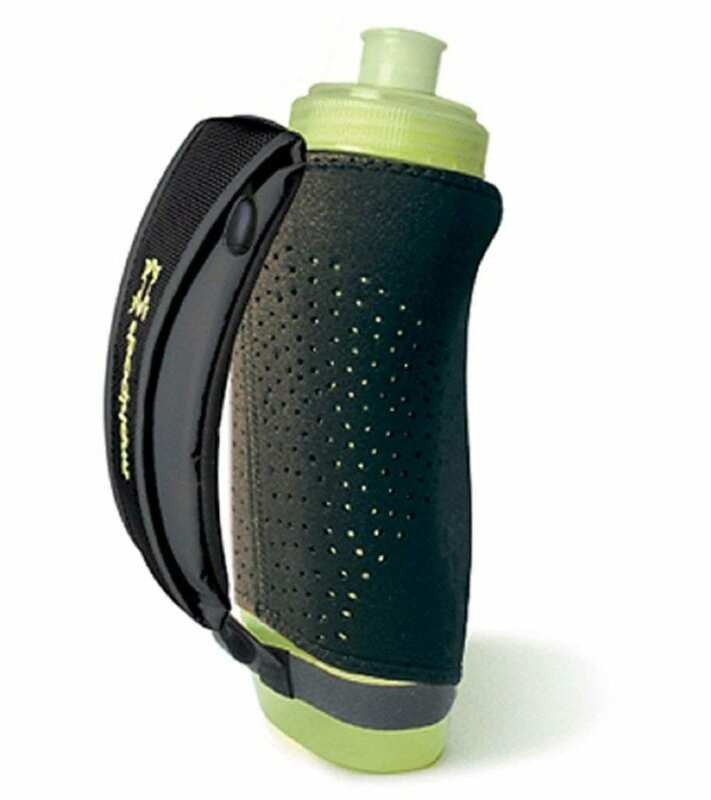 They are BPA free, hold 32 ounces of liquid and are very highly rated at Amazon. They are dishwasher safe, come with a carrying loop and have a silicone straw that works well for most owners. This is one of the top insulated backpacks with a large 2 liter bladder compartment. This backpack also has 3 storage compartments for keys, snacks and other miscellaneous items. 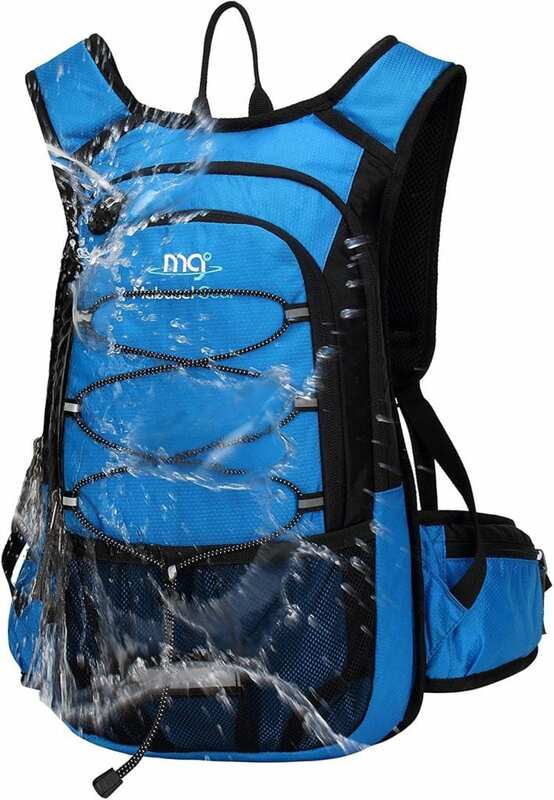 The Mubasel Gear backpack has an excellent system for preventing leaks and includes padded shoulder straps, a breathable design and is designed for bicyclists, hikers or others who need a steady stream of cold water. While the bladder won’t keep your water cold for multiple days, it should hold up fine for the better part of a day. If you’re using an insulated backpack with bladder in extremely hot or cold temperatures, you should consider using an insulated drink tube hose cover sleeve. You might also using an improved bite cover such as this one. Using a sleeve to insulate your hose is a techniques commonly used to protect your hose and mouthpiece from freezing. Also, after taking a sip of water, blow into your drinking hose to push any remaining water in the hose back into the hydration reservoir so it doesn’t freeze in place. 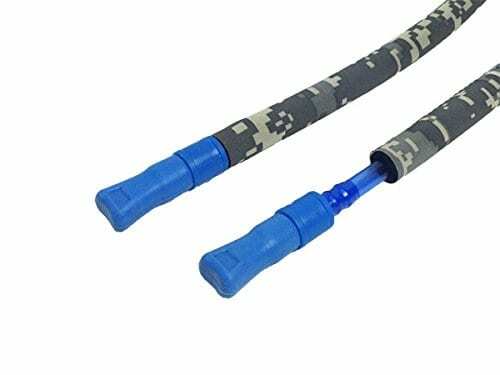 This takes some practice to become automatic, but it really does help to keep the hose clear, even if it is wrapped using drinking tube insulation. If there’s a downside to using a hydration reservoir it that they are difficult to refill with boiling snowmelt on overnight trips without burning your hands or getting your gloves soaked. But provided you are not hiking in very cold temperatures or taking extremely long day hikes, a hydration system can be adapted successfully for cold weather use. 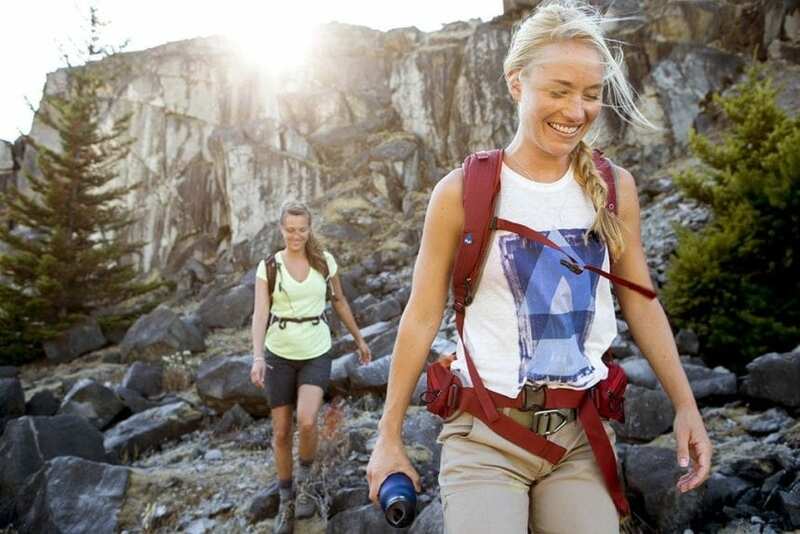 When backpacking or hiking, it’s important to have equipment to filter water. If you’re backpacking, this is even more important. In one situation, I was several days into a backpacking trip and although I found several sources of water, I wasn’t using a water filtering system with enough throughput. I also didn’t have enough storage to carry all of the water that my son and I needed as we made our way from river to river. Part of the challenge came from the trail’s level of difficult and the other complication was the extreme heat. After suffering from heat stroke, I committed to never again sacrifice in this area. And I also purchased a Platypus Gravity Works Water Filter Kit. I can’t speak highly enough about this system. You basically use gravity to filter water by holding one bladder higher than the other bladder. As the water is forced downward through the tubes to the lower bladder, it’s filtered. When you break down the numbers, you’ll find that water weighs 8.3lb per gallon and an adult needs about a gallon a day. This is where I went wrong when I ended up with heat stroke on my backpacking trip. 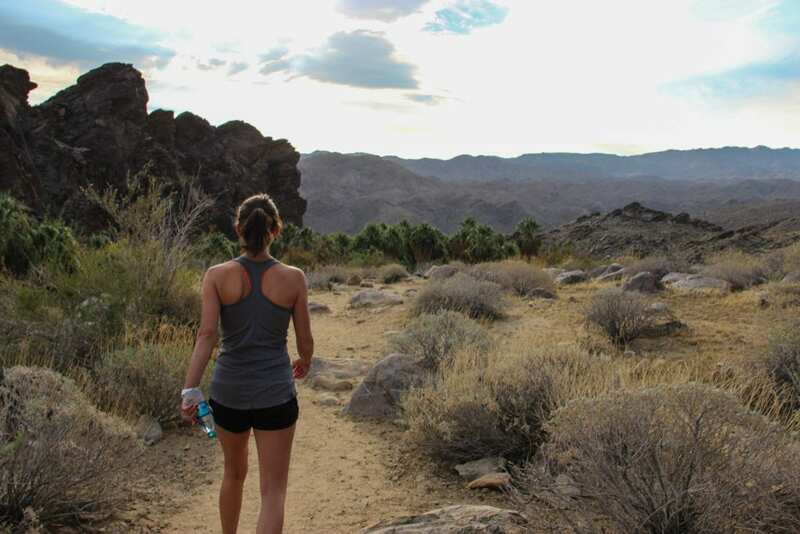 Because of this disconnect between weight and what a backpacking will typically carry, bringing a lot of water on a multi-day trip is not an option. First off, the Platypus GravityWorks system weighs less than a pound at 13.6oz. The filter typically lasts for 1500 liters or 396 Gallons and if you’re buying gallons of water from the store that’ll cost you $350-$400. So, even if you’re traveling to some far away country where you plan on buying a lot of bottled water, you may want to consider packing this kit instead. This kit is also well built. The tubing and the storage bags are high quality and won’t kink or deform; even after many uses. The hoses are long so hanging one bag a distance from the other isn’t an issue. 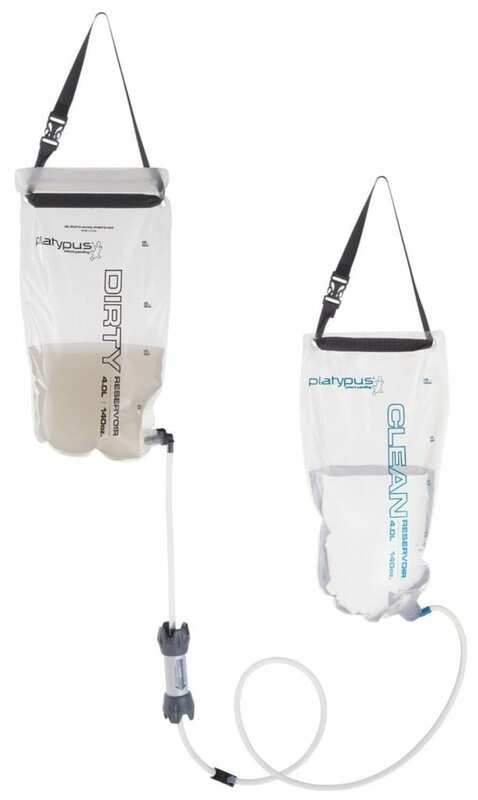 When you want to drink water filtered from this system, simply detach the hose on the clean side of the filter and hang the clean bag as show in the picture. We often hang our bag up near our cooking area and then refill as needed. And if you have water bottles, you can offload water to your bottles and then carry the clean bag with 4 liters of water if needed. It’s hard to know where to begin with this gem. 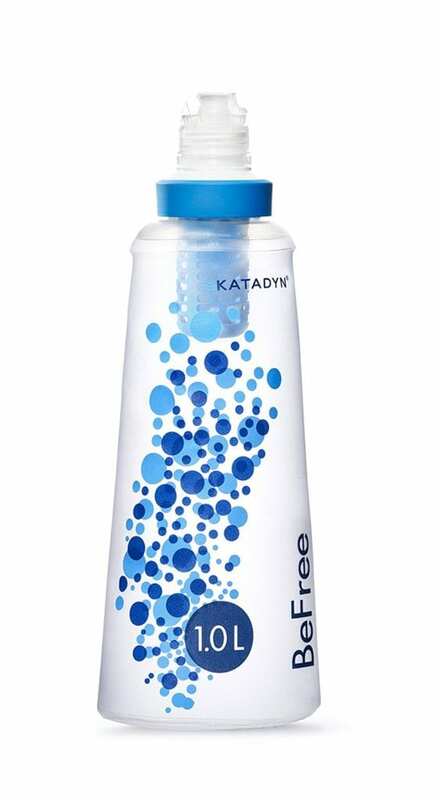 First, I should mention that Katadyn Befree bottles are not inexpensive ($44.95 at Amazon). We have two and have used them for trips to Florida and longer backpacking trip. They remove 99.9999% of bacteria and the filter is also designed to remove protozoa while meeting EPA standards. Most importantly, these bottles are collapsible, so they can be smushed into small pockets or areas. The membrane is easy to clean and there’ no need for extra equipment to keep these bottles in optimal condition. You should get up to 1,000 liters of use without having to worry about buying a new one. Te large opening at the top of the bottle makes filling a breeze. While most other filtering systems require a pump first/drink later approach, you can drink while you filter when using a BeFree bottle. As a marathon runner, I’ve always depended on water bottles that are built for runners. As the sport has grown, more bottles can be form fitted in your palm or worn on a belt. For really long runs of 20+ miles, I tend to use belts. But, for a more typical run a bottle like the Amphipod Hydraform is a solid choice. Just be careful to purchase the right size. Some have found the 20oz a little large, so double check the size before ordering. Even though carrying a cooler may seem like it defeats the purpose when a water bottle will do, there are times when you should consider bring a portable cooler with you. This is often a good option for kayak trips, ATV/motorcycling, or downhill mountain biking. The cooler may sit in your car for most of the day, but in some cases, you’ll need to carry the cooler along to the mountain top or throw it on your back while completing a portage with your boat. If any of these scenarios describe your context, the IceMule Cooler may be worth the cost. There is a 20, 23, 33 or 40 liter pack, so first decide how much space you’ll actually need. Some people purchase one of the smaller coolers and smash them into their larger backpacking backpack. These are designed to be soft and malleable, but they are also very sturdy. 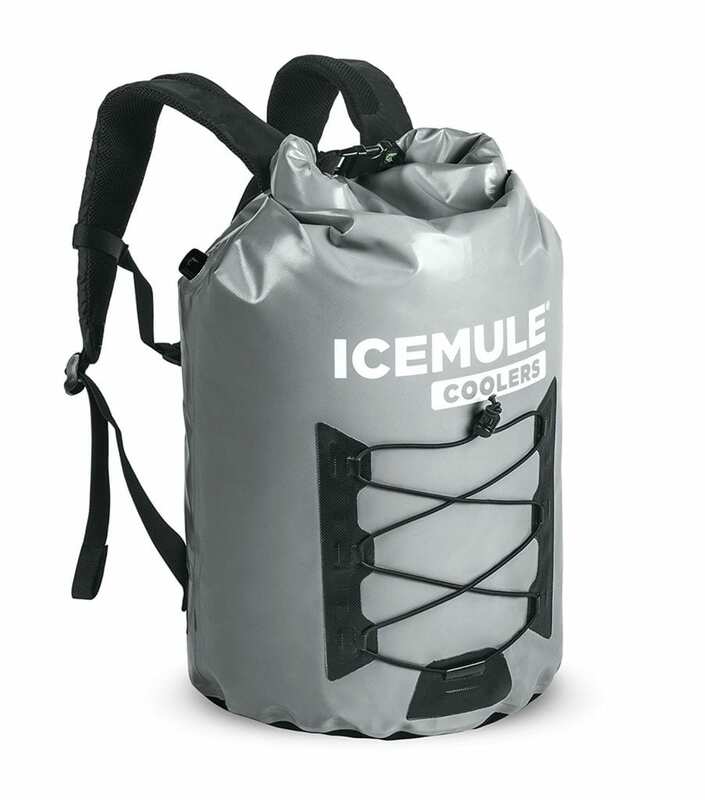 You can find purchase the IceMule Backpack Cooler at Amazon for $99 and up (depending on size). If you’re planning on taking your bottles on a car camping trip, visit out Bicycle New England’s top 20 recommendations for car camping gear or their car bike rack review. Although we didn’t discuss backpacks for your water bottles here, we highly recommend the venerable Deuter 20 backpack as a nice daypack. Lastly, even though it didn’t fit into any of our categories, you might also want to consider purchasing a basic Nalgene 32 oz water bottle. These aren’t insulated, but they are inexpensive and downright predictable. Sign up to receive updates about gear, deals and new blog posts. Copyright 2019 @ New England Gear Guide -- Affiliate Disclaimer--NewEnglandGearGuide.com has financial relationships with a number of companies mentioned on this website, and Bicyclenewengland.com may be compensated if you book via the links on this website or make other purchases with those affiliates. Clicking on affiliate links that originate on this website will not increase the cost of whatever service or product you purchase on our affiliate's website(s). We seek out the best prices for each service and product listed on this website and seek to curate that information as responsibly as possible.